The Brompton World Championships (BWC) is an annual day of races and rides on the iconic British small wheeled folding bikes. Riders flock to Britain for from all over the world to attend. This year’s BWC took place on Sunday 27th July at the Goodwood Motor Circuit in West Sussex where riders had the racing circuit all to themselves for the day. The Sprint – a 500m sprint from a standing start. The Meander – a 26km ride out in the local area. 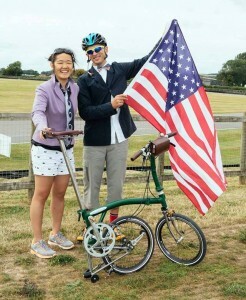 The Brompton World Championships – the main event, a 15.2km race around four laps of the motor racing circuit. 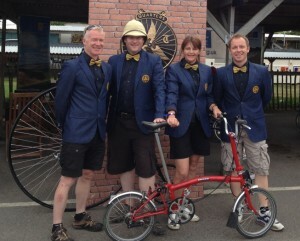 There are also lots of other things going on such as the fastest unfolding of a Brompton and – one of the most hotly contested competitions of the day – the best dressed rider award. There were riders and accents from all over the world at the event, giving it a real international flavour but celebrating the Britishness of the bike and the event. The venue lends itself to the atmosphere as it is very ‘art deco’ with plenty of history. There’s also an airfield in the middle of the track so small planes were coming in and out all day giving spectators more to watch. 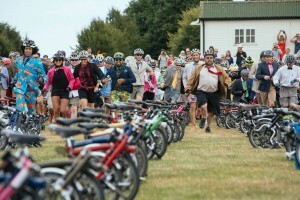 What makes the event so unique (apart from having to ride a Brompton silly distances or at silly speeds) is that all competitors must adhere to a strict dress code. Men must wear a collared shirt and tie, cravat or bow tie; ladies similar elegant dress and no Lycra is allowed on show. People go to great lengths with their costumes and there are some very impressive outfits. Some bikes are also very tricked out and among the fast boys and girls there are some impressively modified machines. 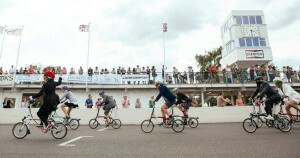 The main event of the day is the Brompton World Championship which saw over 700 competitors take part. It’s a Le Mans type start where riders must run to their bikes and unfold them before heading out on to the circuit. The top seeds are all gridded but each bike has a timing chip so it becomes in affect a time trial with final positions based on time. The mix of people taking part is incredible; there are typical city commuters on standard bikes alongside racing snakes on stripped down machines. Ex Tour de France rider Roberto Heras has taken part before and UK time trial ace Michael Hutchinson has won the event several times. We borrowed a bog standard machine and entered the World Champs with a certain lassiez-faire attitude towards the competition as it was more about the atmosphere and enjoyment for us. Getting to the venue this quickly changed and we regretted not fettling with my machine or at least even using clipless pedals. We thought the initial Le Mans type start was on tarmac but was in fact on grass so road shoes would have been perfect as it was bone dry. Being in wave 4 didn’t help either. The gun went and all the advice about how to quickly unfold the bike went out the window and we were faffing for a while before getting out but at least we were running well in our trainers – compared to others in race shoes anyway. Once on the tarmac it was a case of trying to achieve some sort of aero position as we picked our way through the back markers and looked for a group to work with. It’s amazing how big a difference the three gears in a Sturmey Archer hub can make once you’re racing. That top gear is quite big on a slight drag into a headwind no matter what people say. The laps soon blur which is ironic as you only do four, they tell you at the start that you have to count your own laps and everyone laughs but once on the circuit it’s amazing how you lose track. Thankfully a couple of our group stayed together so we knew we were on the right amount of laps and it was soon over. Drenched in sweat and knackered, it turned out we’d finished 133 out of 720 overall so we can’t be too disappointed. Next year will be very different. With out medal collected it was over to the refreshment area for free afternoon tea and free beer which was going down very well with competitors. The 1st male did the 9.6 miles in just over 23 minutes while the 1st lady in just over 24 minutes, each receiving a custom Brompton for their efforts. One thing that the event did teach us was that small wheel folders are fun to ride and can be pushed way harder than you think. If you havve a short commute we’d definitely recommend buying some sort of small wheeler. ‘Trick it out’ once you get over the initial handling characteristics. They’re great fun as well as practical. 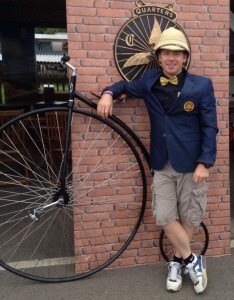 On another note we have now joined the Penny Farthing Polo Club so that will be the next new cycling venture to try after L’Eroica Britannia and the Brompton World Champs this year! Tagged Brompton, folding bike, world championships. Bookmark the permalink.